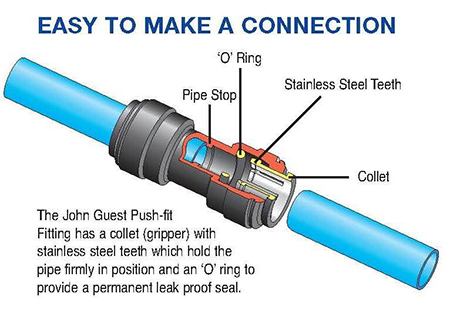 Semi rigid nylon pipe in our John Guest Super Speedfit range is connected with push-in joiners. Available in 15, 18 & 22 mm OD it it the fatest way to install workstations or machinery with higher capacity and less pressure drop and a professional functionality. 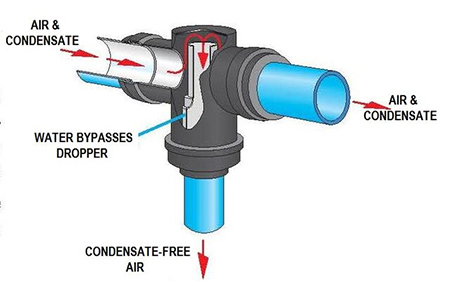 The innovative Water Trap Tree from HJone Guest solves the ongoing problem of moisture in a compressed air system and provides the easy alternative to the need to install “Swan Necks”. The ingenious inside arrangement of the fitting allows air to flow with minimum head loss, from the main to take-off point without allowing water to follow. The moisture is retained in the line to be drawn off at some suitable location.